As Christmas nears, Scott Calvin invites his in-laws to join the festivities. The holidays take a chaotic turn when Scott discovers a way out of his "Santa Claus" and the mischievous Jack Frost puts the big freeze on Christmas' big cheese! Unless Scott can save the day, it's going to be a very chilly Frostmas at the North Pole and all around the world. Will Scott be able to get his job back in the St Nick of time? You know that a comedy is bad when you laugh the loudest at the blooper reel at its end credits. Believe it or not, there is actually a second sequel to this somewhat inane Christmas movie that was first introduced made a shocking 13 years ago. And you should know better than to think that this is a funny movie when the local distributors did not even schedule it for a theatrical release. Tim Allen reprises his role as Scott Calvin, a man who was given the noble role of taking over Santa Clause’s job after a freak accident. 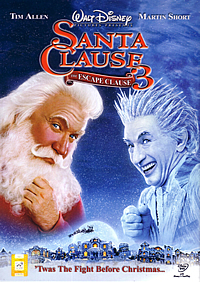 In this third movie, he has to please his in-laws and prevent Jack Frost from taking over Christmas. Somehow, plots like that have become tiresome and the only things that can salvage such a movie from becoming a yawn-fest are its script and its cast. The script isn’t too cleverly written, with unfunny dialogues such as “You're not Santa anymore. You're just the guy who smells like a cookie.” and “You get the Coca-Cola cans, you get the TV specials and what do I get? A few runny noses and some dead citrus.” We didn’t think you’d be chuckling too loudly at these lines. As much as we like Allen (Wild Hogs, The Shaggy Dog), he just doesn’t deliver any memorable comic chops in this bland flick. Playing Jack Frost is Saturday Night Fever alum Martin Short (Treasure Planet, The Prince of Egypt), who gets credit for trying really hard to ham the villainous character up with his flamboyant antics. But the comedian just doesn’t leave any impression at the end of the flick. There are some decent computer effects in this holiday movie, in scenes where fairy dust are beautifully sprinkled and snow globes magically come to life. These are not extraordinary by any means, but they still managed to conjure the festive spirit in us. Like many other Christmas movies, there are usual themes like sharing and caring without being a scrooge, as well as spreading the joy and warmth of the festive season. Forget these fuzzy messages, we have seen them elsewhere before. And although it tries to inject some hilarity, it doesn’t help that the half-baked jokes do not come through either. That’s when you realize that the short blooper reel at the end of the 92-minute movie is the funniest. At first glance, the bonus features included on this Code 3 DVD look plentiful. However, they don’t make up for the badness of the movie. Besides, other than the full-length audio commentary, the rest of the clips are rather short and unsubstantial. Audio Commentary with director Michael Lembeck – You wonder whether the filmmaker really had to record this commentary. He goes straight into the facts without any fluff: 17 tons of white limestone sand was used for the snow, and 1.5 tons of salt was used for texture. The audition process for the elves originated with 5000 kids, then 1000, then 500. At any one time, only 275 were brought on location for the shoot. Blooper Reel – In this merrily-edited three-minute clip, you see the cast having real fun as they forget their lines and giggle at every mistake made. You wonder whether the crew was as amused as them. Alternate Opening – This four-minute segment introduces the background of Allen’s character with footages from the 1994 movie. We’d prefer this version actually. Jack Frost and Mrs. Claus: A Very Different Look – A part of the budget probably went to this little boo-boo. Short’s character underwent an image revamp a few days after shooting commenced. Apparently, his original fluffy image wasn’t menacing enough for a villain. Similarly, Elizabeth Mitchell’s Mrs. Claus was originally plump, but the filmmakers decided to make her attractive after shooting begun. You’ll get to see the before-and-afters in this four-minute featurette. The New Comedians: On the Set with Tim Allen and Marty – Here, you’d see Allen and Short being cheeky on the film set. It was amusing initially in this three-minute clip, but it soon became silly. Creating Movie Magic: Visual Effects Secrets, From the Hall of Snow Globes to Santa’s Fireplace – Check out how the scene at the Hall of Snow Globes was shot with a green screen before the computer artists added the touch of magic in this four-minute clip. Santa’s fireplace which resembles his face is digitally-created too. Christmas Carol-oke – The six-minute video featuring scenes from all the three movies is a medley of Christmas carols like Jingle Bells, Joy to the World and Deck the Halls. Music Video – Performed by Aly and AJ, this three-minute music video entitled “Greatest Time of the Year” is somewhat too poppy for a Christmas song. The visual transfer is crisp enough to bring out the sparkly effect of the holiday movie. There are options of 5.1 Dolby Digital English, Spanish and Portuguese and 2.0 Surround Thai. No matter what language it is, Santa’s “ho-ho-ho” would always be the same.